nahh postingan gue sebelumnya kan bahas tentang King Alex Delpiero, nahh sebenarnya postingan kali ini adalah lanjutan atau lebih lengkapnya melengkapi tentang biografi kapten tim Juventus Alessandro Del Piero. nahh bedanya kali ini gue akan lebih membahas tentang momen-momen spesial dari king Alex. dari awal dia berkarir sampai sekarang yang menurut gue sihh pencapaiannya lebih dari super, bahkan dia adalah seorang legenda hidup sekarang. oke dehh gak usah banyak cincong lagi langsung aja cekidot perjalanan Alex sampai saat ini yang gue rangkum dari situs resminya doi alessandrodelpiero.com jadi pastinya sumbernya terpercaya dan langsung dari tulisan Del Peiro sendiri kata-katanya. sorry juga sebelumnya kalo isi postingannya pake bahasa inggris, nahh buat yang pengen baca postingannya dalam bahasa indonesia tinggal panggil om gugel translate ya hehe. "Wearing The Shirt Number 7"
When I was a child there was just Padova and not yet The Padova. There were Basilica of Sant’Antonio, square full of pigeons, short trips with my parents and field trips with my school. San Vedimiano is only 77 kilometers far from Padova, but for me it seemed to be a long long journey. Now when I think back, I realize that those 77 kilometers were the exact distance between the child I no longer was and the man I was becoming: for the first time in my life I was far from home, always following the ball, that has never ever left me alone. I was thirteen, the number ‘ten’ shirt in Juventus was worn by Zavarov and I didn’t have this number, not even in Padova, playing for ‘Giovanissimi’, in fact, at that time I had number seven on my shirt, the same number I wore when we won the World Championship in Berlin. I spent all my teen years in Padova, teen years of a boy, who left his family in San Vendemiano, with hope, fear, enthusiasm and ambitions in his heart. And the will to play. It seems like I went to the other part of the world, but for me that way was really something huge, because it was the symbol of separation. My Mum still remebers the time when i was about to take the train and she was giving me the last advices:”Stay close to other people and be careful” I had to change the trains in Mestre and there I had to wait for another train for thirty, forty minutes. Then, my parents came to see me in Padova and it was my turn to instruct them:”Be careful in Mestre, changing the platform” My Mum says that exactly at that moment she realized that I had grown up. I grew up together with the others I shared the flat with not far from the AAppiani stadium. Also here I went through all the stages, from Giovanissimi to Allievi to Primavera. The same happened in the National team: Under 16, Under 17 (the first World Championship in my career in Montecatini, I debuted against the USA after two days of high temperature and I failed the penalty in front of Pelè, who was on the tribune), and finally Under 18. I remember well the weekly matches against the main team in those years, when I had to face people like Albertini, Di Livio, Maniero, Benarrivo, Galderisi. There I understood, that I was and could be quite competitve.On the 15th of May,1992 at the Giovanni Celeste stadium, wearing Padova shirt I debuted in Serie B in the match against Messina,with Bruno Mazzia on the bench but above all on that day I lived the emotions of the first goal, scored by a professional player, the only goal in the club team, without the Juventus shirt. On the 22nd of November 1992, Mauro Sandreani sent me out to play against Ternana and I scored 5-1 goal. The number on my shirt was 16 (by the way, how much is 6+1?). On the 28th of June, 1993 I signed my future: black on white, black and white forever. Giampiero Boniperti wrapped up the negotiations with Padova in 24 hours, he had to be quick, because Fiorentina and specially Milan were after me as well. Later on, I came to know that Juventus had considered me to be a valid deal already since 1988, when I was 14. In his autobiography book ‘Una vita a testa alta’ the President wrote that I was his ‘last present made to Juventus’. I was really proud, more or less like for the Cup won. By the way, talking about Cups.. When I came to the Headquarters for the first time, Boniperti took me to the trophies hall: “ Do you see how many trophies have we won? Hope, you’ll contribute to the further growth of Juventus”. Right after that, I signed the blank contract. In my first year with Juventus played in Primavera and was admitted to the main team. 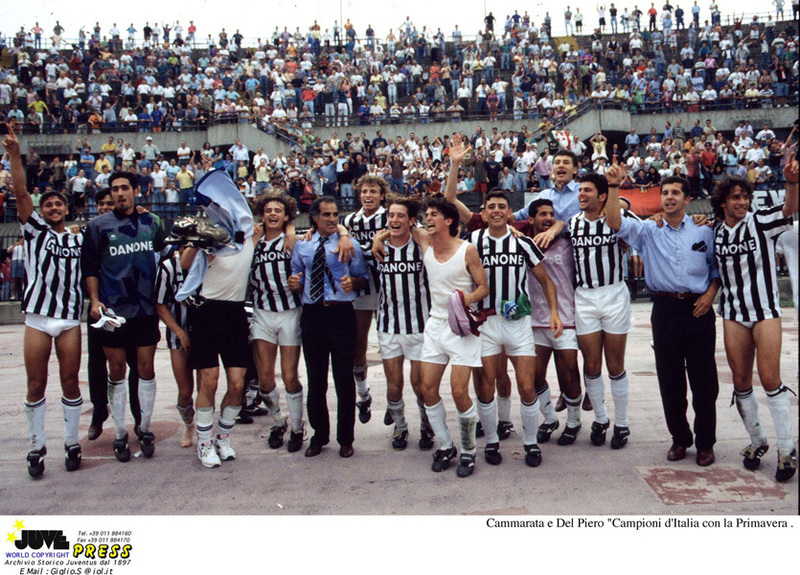 The 93/94 season was extraordinary for us, young players, because of the results: the team, coached by Antonello Cuccureddu won the Viareggio competition (I scored the decisive penalty against Fiorentina in the finals) and the category scudetto (goal in final against Torino) Instead, the season of the main team had nothing to remember. But I’ll never forget my 14 presences, the debut in seria A against Foggia on the 12th of September, 1993, substituting Ravanelli at the 74th minute, and then, seven days later, the first goal, wearing the black and white shirt, in the match against Reggina, right on the day of my parents’ wedding anniversary. "Number One in Italy, in Europe and in the World"
My first Juventus season coincides with the turning point in the society. 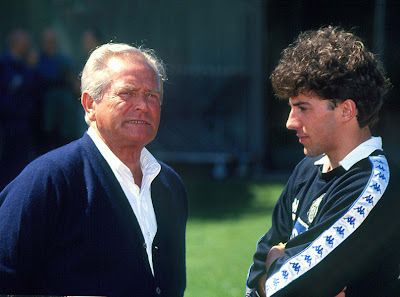 April, 1994 was the end of the Boniperti era and the beginning of the Triade period, the arrival to the society Roberto Bettega and a bit later Antonio Giraudo and Luciano Moggi. The new team was born, based on the one left by Boniperti. Coach Trappatoni was replaced by Lippi. I was permanently moved to the main team, and started playing as fourth forward after Roberto Baggio, Gianluca Vialli and Fabrizio Ravanelli. I knew I had to fight to conquer this place, but the previous championship gave me a lot of confidence and I was able to play as well as the others. The game system was 4-3-3 and I exploited at most the oppotunity when Baggio remained out because of injury. At the end of the season I was proud of 29 presences and 8 goals scored in Championship, plus one in UEFA Cup and one in Italian Cup. But what really counted was that we were winning and winning. And since that time we have never stopped, despite (a lot of) ups and (some) downs. That was an extraordinary group, that has become a Team – I want to stress out the capital letter – match after match, overcoming difficulty after difficulty. The crazy year, charged with exciting moments, but also with the worst of tragedies: the death of our team mate Andrea Fortunato. We came to the end of the year, having won it all, the only prize we left to Parma was the UEFA Cup. After nine years break Juventus was back to win the scudetto, my first title won. We also managed to win the Italian Cup against Parma, our opponent of the season. I felt like flying: the 3-2 goal against Fiorentina, the one against Lazio at the Olimpic Stadium, another one against Napoli. Compliments, the first contracts with sponsors, full attention, interviews.. In one of my first interviews I said: “Everything what is happening now, seems to be exaggerated, but I like it”. Yes, I liked it… And because of that I couldn’t have stopped there. At the end of the season, Baggio left and Juventus aimed at me. My only pity is that I couldn’t have played with him a bit more, but I never agreed with those who said that me and him didn’t go along. For me Baggio has always been the example to follow, the great champion. That’s why it was a real honor for me to take his place and his number on the shirt. In the 95-96 season the only dream for us and for our fans was to win the Champion League. This dream came true on the 22nd of May, 2006 in Rome, in one of those nights, that seems to be unique and never to be repeated in one’s life, because it’s impossible to be happier. But fortunately, I lifted up also others Cups. The way to get to Rome wasn’t less extraodinary than the final, both for me and for the team, with those goals “alla Del Piero”. For the first time I played the final wearing the shirt with my name printed on it. 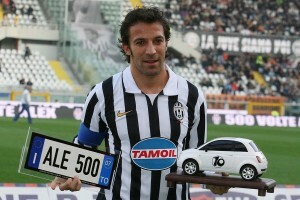 Fortunately I arrived at the right moment, “10-Del Piero” has become mine and nothing can change that anymore. The only time I take it off is to put on the shirt of National team. The first time I was summoned to the National team, with Sacchi on the bench, was during my retreat in Borghesiana with Under 21. On the 25th of March, 1995 I debuted in National team in Salerno against Estonia. In that season i also played, wearing the shirt of azzurini of Maldini and for National military team, as in between one match and the other I was also serving Naja in Naples. I remember that one newspaper calculated that during that period of time I did around 40.000 kilometers form south to north of Italy. And not only. I got ot Tokyo. In 96/97 season the team changed Vialli and Ravanelli left and in their place arrived Zidane, Boksic and Amoruso. What did never changed was our desire to win. We became the Champions of the world, wearing black and white shirt, that had long sleeves and no sponsor logo on it, like Platini’s Juve. I scored the victory goal: I left Tokyo with the Best on the pitch Cup and with the car, supplied by sponsor. It didn’t fit on the plane… But the Cup did, that one we brought home: taking into consideration the other two Super Cups Italian and European, we had pocketed Big Slam. Unfortunately we didn’t manage to win Champions: in Munich against Borussia full of our ex team mates we lost the match, that if played other ten times we would never lose. I couldn’t be comforted by the great back heel goal at the beginning of second half, and not even by the second scudetto of my palmares. The same story happened a year later, without Vieri, but with Inzaghi in his place: Italian Champions for the third time in four years, defeated in the final of Champions, but this time by Real Madrid. I scored 29 goals, my personal record. I reached my first World Championship in France, worn off by tough season and by sprain I earned in Amsterdam final. Italy was eliminated in the last 16 by France of my team mates Zidane and Deschamps. Having lived through a fantastic year I expected the better final, but as at European Championship in 1996 in England we didn’t manage to come to the end. To get to the top of the world, wearing National team shirt I would have waited some years more. 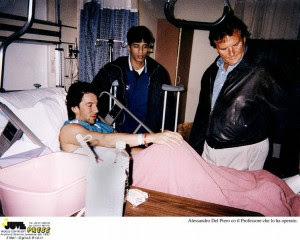 "The Injury : Before and After"
The 8th of November 1998. The eve of my 24th birthday, Friuli Stadium in Udine. We were on the top of ranking table, alone and winning against Udinese in the game out. The match was almost over. Even today, I still ask myself, why did I have to run after that ball, that was going towards the end of the pitch and I as I was blocked, even if I had reached the ball , I didn’t have any opportunity to score. The useless effort, that I paid dearly: the left knee was broken. I understood immediately that it wasn’t an easy funny thing, but something very serious, the pain was excruciating and like this alone wasn’t enough, right after I left the pitch, Udinese drew and Fiorentina reached us at the first place. Despite numerous injures in the past, typical for all football players, I, in the first place, call that of Udine ‘ The injury’, like it is the only one. Because of it I risked my career and that injury divided my sport life in before and after phases. I broke the knee after five years of constant success and satisfaction both with Juventus and on the personal level. Then, something went wrong: We lost the Champions final, the World Championship couldn’t be really enjoyed, because of muscle injury, that I got right in the final match against Real, despicable doping accusation of Zeman. And then the injury. The watershed of my career. I was scared. On the 26th of November I was operated in Colorado by Prof. Steadman. Fortunately everything went ok. That was the time to welcome back the hope, the courage and the will to start all over again. Yes, to start from scratch. Rehabilitation, physiotherapy, hard, hard work , learning to live with the pain and then, finally, the first improvements, work again and again, the beginning of training, that day by day was becoming more and more intensive. Finally I was ready. Only when I came back to the pitch and to the goal, in Cesena, Intertoto competition against Rostelmash, on the 4th of August, 1999, I stopped asking myself why did I follow that ball, in Udine and somehow I understood that it just had to be that way. All what happened, helped me to change and to improve certain things. Both in a man and in a football player. The long pause and all what it brought about, pushed me to grow up as a player and to become stronger from all points of view. Analyzing the facts and the numbers, I found out that I scored even more after the injury, than before it. "Thirty Four Out of Thirty Four"
The return to the pitch after the injury, unfortunately didn’t overlap the period of return to victories. I came back to the Juventus, that was fighting to conquer the place in Europe through the Intertoto, and without Marcello Lippi on the bench. His place was taken by Carlo Ancelotti in February 1999. During my long break, for the second time since 1993, I renewed my contract with Juventus. That was a wonderful sign of trust on the part of the society. Coming back after a long period of being out at the edge almost for a season, is not easy to take up everything immediately and soon I understood that everything I had done before didn’t count. I had to start playing again. On my side I had a coach, that strongly believed in me, sometimes even against all odds. I have a wonderful memories of Carlo Ancelotti, both a coach and a man. I’m sorry for not being able to say that I won something with him during that period, but we came close. Our team and scudetto were separated only by the power of downpour in Perugia. I wrapped up that Championship with 34 presences out of 34, the only regular player, having scored nine goals, one of them in action. "A Goal (and scudetto) for I’Avvocato"
2001/2002 season: In Juventus everything was changing, around me and not only. Inzaghi left the team, and Trezeguet took his place by my side. Ancelotti went away, but Lippi came back. Zidane changed the team, but Buffon, Thuram and Nedved joined Juventus. Right from the first day of Championship I had a feeling that this year was a good one to become winners again: right from the beginning I scored two goals in Venice, for me those were goals number 100 and 101, scored in the Juventus shirt. Two goals were also scored by David, together we formed the best forward tandem of the championship and a bit later we became also the best teamed up players in the club’s history, leaving behind even the legendary Charles and Sivori as for the number of the goals scored together. 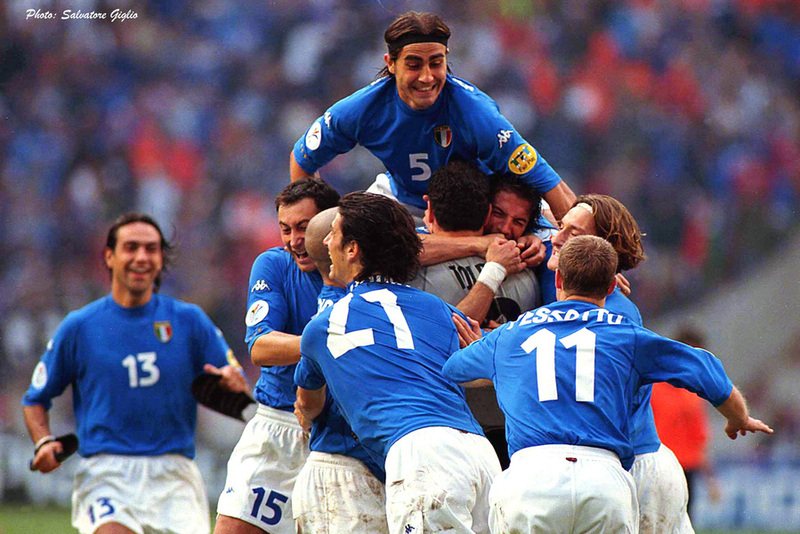 The season had a good start also in the National team: on the 6th of October, 2001 in Parma I scored the penalty goal in the match against Hungary, the goal that was worth the Qualifications for the World Championship in Japan and Korea. For me that was the 16th out of 45 presences in National team.. With great enthusiasm I concentrated on the Championship. But the way back to victory wasn’t always the rainbow and butterflies. In Champions League we didn’t go further than the second round and in Championship we wrapped up the first half of the season on the fourth place, behind Roma, Inter and Chievo. The event that left a trace not only on our season, but also in the private life of a lot of us, including me, was the death of Avvocato Agnelli, on Friday, the 24th of January, 2003. Just some days before it happened, he had called to congratulate me for my goal in the match against Celtic. It was the very last call I got from him, probably that’s why I remember it better than all the others. It came as usual at dawn, as it was in his habit. He said: “Del Piero, are you awake?” And me, rubbing my eyes and with the typical voice of someone who was just awoken by the sound of ringing phone, answered: “Sure Avvocato, good morning”. Just once I found the courage to answer:” No, Avvocato, actually, I was sleeping” And he, without any trace of being upset, continued:” Ok, so it’s time to get up and go training”. Of course, having met Giovanni Agnelli was the event that had influenced greatly all my life, I think that I was really blessed to have that special relationship with him. I miss him a lot and so does the Juventus. Two days after the funerals, I scored the goal that can be considered one of the most beautiful in my whole career. It happened in Piacenza on the 26th of January, 2002 in the match against Piacenza. Zambrotta crossed from the flank and I managed to score right footed volley. I didn’t have any doubts whom dedicate it to. To Avvocato Agnelli, he would have loved it. From that moment onwards we started our great recovery, crowned with overtaking Inter on the last day of Championship.. On the 5th of May, 2002 we played in Udine, having one point less than Inter. It was just enough for them to win against Lazio to get the Italian Champions title. Instead they lost 4-2. We won 2-0 with the goal scored by Treseguet and the other one scored by me. To seal our victory was the great season we lived as a teamed up partners: nobody in Europe scored as many goals as we did, 40 goals between the two of us. “Fifthofmay “ has become one word, the almost historical date to be remembered by all Juventus supporters and by me as well. One of the biggest emotions of my career. To be dedicated to Avvocato. I waited for this moment for four years, too long, without rising any trophy. There were all the good signs to compete in the World Championship, but in Japan and Korea, Italy was eliminated in the last 16, in the match against South Korea and I don’t want even to think of that day. Trapattoni left me on the bench for the three games in the qualifications round, but I managed to score the Qualification goal in Oita against Mexico. I was very disappointed, because I was real fit and I still think that we had an enormous potential that we didn’t exploit fully. I prefer to keep as a memory the last match against Korea with Maldini by my side. Paolo Maldini, the champion and the extraordinary man, I think it was a real fortune that our paths crossed. As for the rest…. I had to put off the meeting with the World Cup for the second time, but, only to put off for a while. With Juventus ,instead, the second consecutive scudetto arrived right on time: it was the 27th scudetto for the society and the fifth one for me. I scored 16 goals in the Championship and five in Champions League, the exciting progress from the great night at the Delle Alpi Stadium against Zizou’s Real up to the Manchester Final, unfortunately without Nedved, who was disqualified in semi-final. All this is sport, glorious moments and then, slaps in the face, that hurt, like those failed penalties against Milan. Another Final lost. The rematch came, three months later, still on penalties, at the Giant Stadium in New York. Unfortunately, it wasn’t Champions League, but Italian Super Cup, the only trophy won in 2003-2004 season. My season in National team didn’t end in the best way as well: we were eliminated in Portugal in the first round, Trapattoni was replaced by Lippi, whose place in Juventus was taken by Fabio Capello. "183 steps to enter the History"
Two seasons, lived together with Fabio Capello, the new Juventus coach and with my new team- mates Jonathan Zebina, Fabio Cannavaro, Zlatan Ibrahimovich, Emerson and Patrick Veira. I remember very well 14 goals I scored in the Championship of 2004-05 seasons and three goals, scored in Champions League, that, unfortunately, didn’t have a happy ending for us, we dropped out in the quarter final, having lost to Liverpool. But above all I remember one of my assists, the one performed in scissors kick at San Siro against Milan. It was used at most by Trezeguet, who scored the goal that brought us scudetto in the match against Ancelotti’s team. Some days after the great celebration of the 28th scudetto, on the 12th of June 2005 I got married in the small church on the hills of Turin. That was exactly what you would call very intimate ceremony: all together just 20 guests including the priest, only close friends and relatives. Nobody knew about the wedding date, or almost nobody. Sonia and I decided to be absolutely discreet , not because we wanted to leave someone out, but because we wanted to have this moment only and totally for us. And it was exactly how we wanted it to be. Wearing the wedding band and after the wonderful honeymoon, I got to the beginning of 2005-06 season, the season of the World Championship in Germany… I have never had any doubts, that one day the World Championship would be my event, and honestly after two goals and seven assists in the qualification matches, I had a feeling that it would be our Championship. It didn’t come out of the blue, it was a great season, both for the team, that won the 28th scudetto and for my personal very important targets reached. I remember well the cold night at Delle Alpi Stadium, warmed up by my hat trick, that let me enter and remain in the History of my team. Yes, 183 (plus another 2) steps into the history, to leave behind the legendary Boniperti and to become the best ever scorer of Juventus. Out of all numbers, out of all the records established, I consider this one to be among the most important . All the goals that were scored later on and all the goals that are still to be scored, have only one purpose: to complicate the life of the guy, who one day might start thinking of ousting me in this table. I remember well all the 20 goals, scored in 2005-06 season, and among those also the penalty against Inter at San Siro, that was absolutely necessary to win the scudetto in the last match away and then, celebration with my ‘tongue stuck out’ ritual, already enough well-known, but that became the symbol of that season.. Don’t ask me why did I stick the tongue out, it just came like that, but let’s say that by now I get used to like this way of rejoicing…. Talking about celebrations, the one in Bari, on the 14th of May, 2006, for the 29th scudetto, was the most strange, contradictory , suffered and angry in my whole career. We already knew that the world was crumbling all around us, but we also knew that we earned the celebration, sweating hard to win on the pitch. And it has to be really clear: my team- mates and I won those scudetti, playing and fighting for them on the pitch. Full stop. That’s why I remember and will never forget these two fundamental periods of my career, two targets reached , two achievements nobody can ever take away. That’s exactly what is dear to me in those two seasons. That’s it. I’ve said it all. The rest are the days that changed our lives, the days we became the World Champion. I couldn’t have even imagined what had happened in summer, 2006. But it happened, it was true and real and I found myself with scudetto won and then, taken away, with the World Cup in my hands and the anxiety of uncertain future for my team, that was even threatened to be placed in Serie C (!) in the end I woke up in between the dream and nightmare, being certain just about one thing: I was already there and I was to remain, no matter what was about to happen. I got the news about the Juventus sentenced to Serie B minus 30 points, while being on holidays after the victory at World Championship. It was just crazy. This was the right moment to start fighting. Back to Vinovo, I set off for the new journey without many of my team-mates, with the society full of new managers and with the new coach ( Didier Dechamps was my ex team-mate, and this was his first time as a coach). The new challenge awaited ahead. The Court of Appeals reduced the sentence to Serie B minus 17 points. Finally our destiny was clear. Crying over the spilt milk, arguing and discussing wouldn’t ha brought anything… In my head I was already thinking about the moment when I’d say: ok we are back to Serie A, but I didn’t like just one phrase “the hell of Serie B”. Because normally to hell goes the one who deserves it… I don’t think that, we, players, deserved it. And, there’s no way out of Hell. Instead, from the very first moment I threw myself into this adventure, I knew that one day we’d be back to Serie A, stronger than before. In fact, that championship was some kind of a real comeback to the very origins of football, not just mental, but a real comeback. Some kind of the very beginning. I started all over again from Padova, where years ago o scored the first goal, being a professional player. The only one I scored, not wearing the Juventus shirt. I started appreciating the continuous training, without the transfers in the middle of the week, careful preparation for only one game, matches played in the afternoon, free Sundays (because in B you always play on Saturday afternoon). Well, I tried hard to find the positive side of the situation..but not for that reason I remained in Juventus. There was something special that made me look further than just not playing against the best teams, getting the better out of Italy and Europe, going out for dinner on Tuesday or Wednesday when there was Champions League on TV. I think it was the deep sense of Juventus, being my home and all what was happening to the society to the team and to our supporters made disappear even the smallest intentions to go away. Already in August I realized that I had made the right choice. I was perfectly fit and surely not just by chance. With just a bit of training I felt myself already bright and quick in movements. I do remember the feeling of being carried away by the strong stream and the feeling of being inside it. Right from the beginning of that abnormal season that was my sensation. Being carried away by my will, by the awareness that I was doing the right thing. Deep inside, playing in Serie B, helped me to somehow get back my youth and this is the greatest advantage. I know that this was my destiny, it was something that never happened to anybody else: on the peak of my career, holding the World Cup in my hands, on the 9th of September 2006 I arrived to Rimini, to play the match in Serie B. 14 years passed since the last match I played in Serie B in Padova. But this time I had three other things on : black and white shirt, captain band on my arm and number 10 on my back. I know that it didn’t happen by chance that my 200th goal I scored against Frosinone, the team that was mostly teased by those who laughed at Juventus in Serie B. The center forward goal that came from the right pass half-turned, from the keeper rash coming out, from Nedved’s shot that hit the pole and from Trezeguet knee kick. And if you look at the names, together with Buffon and Camoranesi, there are other players who came from World Championship to Serie B. For me it was also the season of 500 presences with the Juventus shirt on and above all, the season, where I was given the title of best goal scorer of the Championship-21 goals scored. It was real important for me, because I didn’t snob out this adventure, I gave my best on all the pitches,( I played on all of them before, I wasn’t born on Bernabeu!) I fought and was attacked, it had been a long time since I’d played football so purely physical. At the end we made it. Full promotion, that we celebrated in Arezzo on the 19th of May 2007 with two assists and two goals. I knew it would have been like that, from the very first day, from the very first goal! The one I scored on the 23.09.06, in Italian Cup against Cesena keeper Dino Manuzzi, on the stadium I was back to play on after my long injury in 1999. That was the first game for me after the World Championship. I was on the players’ bench. Deschamps asked to enter the pitch. Everything happened in no time: around 16 seconds passed between my joining the team on the pitch and the scored win goal. The same time of that ‘coast to coast’ stream that led me to my goal at World Championship against Germany, just less than a month ago. I was still there and I was “to remain”. I knew it’d be very heartwarming. I felt it on the day I signed a contract and took a peek at the new stadium, that was still a building site. I guessed right, because I’ve imagined the moment of inauguration thousands times, the idea of a new stadium has been with me for a long time. But, honestly, I couldn’t have imagined anything like that. Anything so heart-rending, so breathtaking, like a bench that was flying in the sky before President Boniperti and I started to talk. A moment of a pure magic that almost moved to tears me and forty thousands people at the Juventus Stadium. I thought really well about what I was going to say. I don’t like writing speeches, I’m sure that if I read the text it’d have been anything but spontaneous, instead I absolutely wanted to communicate my feelings: my pride and pleasure to be there, the admiration for everything I saw. I concentrated on the main concepts I wanted to get across, but I’m not sure I followed the order I’d outlined for myself earlier. I was overwhelmed by emotions, I played a lot of matches in extraordinary scenario but to talk to people like that, on a night like that was something completely new for me. To make all the difference was that bench. A symbol of Juventus history, the object that started it all years ago, in 1897. On the dark field, standing in the spotlight together with Boniperti, I felt like it had lighten me up. I believe that our speeches lasted around ten minutes, interrupted by cheering and applauses from our supporters. But it seemed like eternity for me, very long, intensive, real journey back in time. It came spontaneously to remember all the black-n-white stadiums I played on: Comunale, where I played with Primavera; Delle Alpi, a place of our victories; and Olympic where we fought to be born again. And then, the President added another important date, the 4th of June 1946, when he started his life in Juventus, having scored 7 goals in a test match. He reminded a wonderful phrase that should be a motto of everyone who wears black-n-white shirt: “ It’s not important to win. It’s the only thing that counts” I added the words that are necessary both for football and life: passion, love, courage, will and determination. And this is my signature on the year to come, and what it takes to be Juventus all the way. I felt at home, really. A house of all of us, juventini, house we built up with all our strength and energy coming from our history. I just want to welcome you on the Juve Planet. The new stadium is really another world. And I wanted to honor this new stadium with a special t-shirt, designed for the occasion and worn by my closest friends You’ll see it soon, it represents all the stadiums I played on. The Juventus stadium is a symbol of a long journey that I’ve travelled so far together with you and your support. "2000 – FRANCE, ZIZOU AND ME"
With our National team I was lucky to meet the strongest teams of the world: Germany, Brazil, Argentina, England, Holland, Spain… But, undoubtedly, the opponent team that left the most significant trace on my career in National team was France. It’s always been our eternal rival, a bit because the Bleus mark an epoch ( all those years from World Cup won by French team at home in 1998 till Euro 2000, and then till “our” World Cup in 2006) and to win we had to keep this in mind; but also because a destiny took care of always bringing us together to play against each other, some kind of curse that seemed to be impossible to break, at least till final crazy joy in Berlin when it was our turn to celebrate. France, that France, has a real first and last name for me: Zinedine Zidane, my team mate, oops, sorry…an opponent I leaned on while we were joking with Salvatore Giglio, a photographer who was taking pictures. This picture was taken just few months before European Cup 2000 and in my opinion is more than perfect because it’s totaly sincere and natural even if it was taken on a set during a special photo session. I’ve chosen this picture to help me to tell you about the strange rivalry with French national team. I call it “strange” because undoubtedly this team has been the strongest and the one to be feared for years and so to win against it was rather satisfying. Apart from that, this team had a lot of stars, among them an extraordinary champion that was an adversary for me only for those 90 minutes. Also for this reason I love this picture: two different jerseys worn by two friends that used to be in the same team. Two friends that after a match in two opponent teams, spend time together as friends do and enjoy each other’s company as you can see well on this picture. Surely, sometimes it was pretty hard to find the will to smile, before and after our matches. I’d say almost impossible, at the begining especially for me. I told you about that kind of curse…first in France, where they were at home…Damned penalty kicks… And then, in Holland, penalty kicks once again, even more damned, when we were so close to win the European champions title, taken away from us by one more opponent player, who was an adversory only for those National team matches, I’m talking about David Trezeguet. Then there was a moment of our so long awaited win, a moment to break the spell: and surely, it couldn’t have happened at any other time but during the penalty kicks, like we were able to win or lose only in this way, fighting till the last minute, being equal and ending up in draw. That night in Berlin I had to cheer up Zizou (but also David, Patrick, Lilian and a lot of other French players that I do respect much). Before it was the other way round. My friend had to cheer up me… My friend, never my enemy, even if his jersey was of the opponents’ team like the one he’s wearing on this picture. "2006 – CHAMPIONS OF THE WORLD"
This is THE moment. I think it’s difficult to find another picture that convincing to describe the emotions that can’t be put into the words. In that precise moment I understood that the Cup was ours and the only thing left to do was to start running like hell to take it. The 9th of July 2006, The day. A moment earlier. 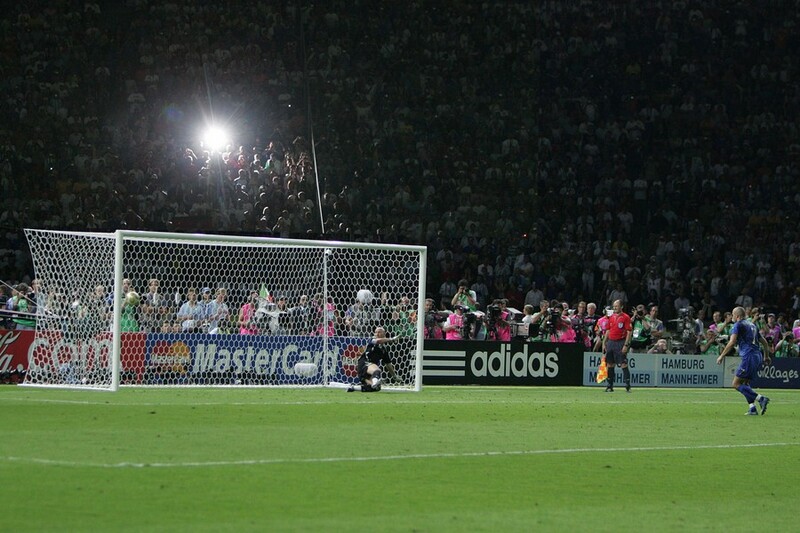 Fabio Grosso is on the spot, ready to take the penalty kick that will make us the Champions of the world. A moment later, right this one captured on this picture. Fabio Cannavaro and I, Juventus team mates, he was my captain in the national team, while I was his in Juventus, already hugging, and a second after we would be joined by all our team mates that were already running like crazy toward us to rejoice together. In between these two moments there’s kind of nothing, the feeling of eternal waiting, the total silence, memory that struggles to bring back everything what was going on in that exact moment because the only thought was about what would happen later, the only hope was for that ball to enter, it was impossible to find the courage to look and so the only thing left was to wait for the explosion of shouts. And then finally it was over, I started running like mad, shouting from joy and liberation, living through a blast of feelings. If you look good, on the background of the picture you can see French players, desperate, frozen after the last goal that killed their hope to win. The beauty of this picture is also in this, even if they would never agree with my evaluation…but in this case I don’t talk about who won or who lost. I just say that this image contains everything what is there in a match. In that match. And I’d say generally in sport. The joy to share, personal and of the group at the same moment. Anger and disappointment of a loss when you were so close to win. On the foreground there are two team mates hugged together and ready to be swept away by the triumph, on the background there are other players, one holding his head in his hands, the other one with his arms crossed. A disappointment to live through alone, because in this exact moment you don’t want to have anybody next to you, the bitterness of a loss doesn’t go well with the joy of a victory. Victory and defeat, endless happiness and anger. On the same picture. The memory of a moment I understood to be the Champion of the World. "1993/1994 – ALWAYS WATCH YOUR BACK…"
I seriously don’t remember what match it was. I only know that Angelo Di Livio and I were coming back to the center of the pitch after cheering for the goal. I don’t know if Angelo had it all arranged with Salvatore Giglio, the photographer who took this picture, before… But the fact is that I noticed it all only after the picture was already printed. A bit like those classic group pictures where the troublemaker of the class, in the last row entertaines himself making fools out of his classmates (horns and stuff), and then, later everybody sees it only when the picture is already printed in a school yearbook. Apart from jokes, I wanted to talk about this image because it takes me back to the happy for me and my Juve period and above all it reflects perfectly well the nice atmosphere of friendship, joy and the will to fool around that distinguish all the changing rooms that “work”. And this one worked really. Angelo and I first met in Padova, we became friends and team mates long time ago when we didn’t even think about black and white jersey. When Padova was in serie B and Di Livio was the anchor of this team, I was still a boy who tried to give all his best to get noticed and have a chance to make to the first team. Both of us were taken to the Juventus by Giampiero Boniperti in 1993’94 season. Since then we played six seasons together, and we won it all. And we shared it all. Apart from being an excellent player of his team, useful, tactically intelligent, full of energy and exceptionally determined, Angelo should be taken as an example of what does it take to build up a winning group. That is somehow connected to the feeling of joy and amusement this picture is full of. A football team isn’t that much different from a school class, above all when it’s united and the guys are close and enjoy being together. All in all that period of my career from the sportive point of view was kind of “big team school”, the time when I was twentish and had next to me older team mates who taught me a lot. For example I learnt from them that sometimes a smile or a joke cracked at the right moment can be as important as an assist on the pitch, because it helps a lot to create a right mood, comaraderie that is necessary to be a team. I learnt it all in those years. And I learnt to watch my back to avoid some surprises like for example this picture…. 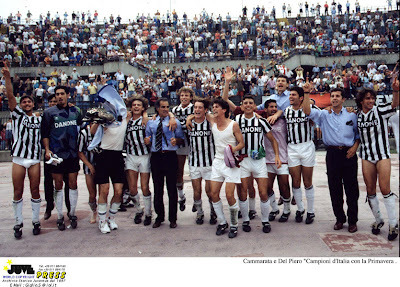 "1995 – MAY 22nd 1995"
The club has just made known the name of the new Juventus coach and I couldn’t but take out of the drawer this beautiful picture. To understand better its appeal or better to say, to enjoy it fully and share the fun we were having, this picture has to be animated. Like that you could have shared the healthy craziness of a group of youngsters that were celebrating their first Championship victory in direct broadcast, connected to the Novantesimo Minuto (90th minute). In these moments a lot can happen. And trust me, not even the experience can make you control the situation, just to think about some scenes we invented right on the spot some years later on the 5th of May 2002 ( I don’t think I have to say something else, it’s a date that doesn’t require any additional explanations). So I was saying: Rai channel was connected, we were screaming off our lungs from joy, having won the 23rd scudetto of Juventus. Unstoppable happiness. Sure, by that time we had been leading already for weeks, but right to the end you don’t believe and I guess it’s ok like that: in football math isn’t an option and to be proclaimed a winner you have to be the one for real. How much that team was united, you can understand looking at this picture. We all have the same expression. But there was one of us who was smiling more than others, because he was about to pull the prank. If Youtube existed it’d have made 14 millions of contacts in a day, all our supporters would have connected to assist to Antonio Conte’s show. Antonio looks directly into the camera, shouts that in that year we’ve given “blows”(mazzate) to all and in crescendo expands the message: “blows, double blows, triple blows”. All this, delivered in perfect Lecce slang and accompanied by typical southern gesticulation ( even though, the way he twirled and moved his hands, he, perhaps , felt himself a sort of Bruce Lee). And Galeazzi, in the office in Rome felt embarrassed… Like one says the beauty of live! More or a less similar scene I experienced only once in the national team. But that was during the final, in Berlin, while the match this picture was taken at was unforutnately only a semi-final: here we were only half way, that later didn’t end like we wanted it to. However, it has nothing to do with the magic atmosphere of that night: the 29th of June, Euro 2000 co-hosted by Belgium and the Netherlands, Amsterdam Arena, we played against Holland. 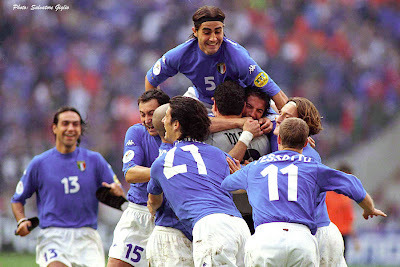 When I look at this picture where we all jump on top of Francesco Toldo, the first thing that comes to my mind is:”How did we do it?” In all my career there was no other game like that one. We ended up playing in 10 against 11, because Zambrotta was sent away at the 33rd minute of the first half and then… the orange-coloured siege! They dominated for the whole match. We never gave up, defending really well. Holding together, being very close. We knew that we had to resist just one more minute, than another one and one more and at the end we would come to the result we wanted to have. To the hug on this picture, that tells it all better than a lot of words. As you can see, I was the first one to hug Francesco. I started running toward him from the middle of the pitch and I came first. He was the hero of that match. Dutch will remember him forever: in 120 minutes they kicked six penalties and scored only one, practically non influential. Twice in the regular time he managed to hypnotize first De Boier, then Kluivert ( great save in the first case and goalpost in the second one) and then, after the 0:0 result in the extra time… another save with De Boer, Stam too high, Kluviert goal scored, Bosvert saaaaaave! That’s how we arrived in final. Surely, in that hug, there’s all our gratitude to him, for everything he did in that match against Holland, crowning all the efforts of the team that suffered for the whole match, but never lost the hope, playing the defensive game that was after all very intelligent from the tactical point of view. We did our best to obtain the great result. I do remember that I played all the game as a full-back and like me all my team mates gave their best and even more to resist and then, at last, enjoy the result, worn out, exhausted, but happy. "2004/05 – REFEREE AND I"
2004/2005 season, the season of our 28th scudetto. The last season for Pierluigi Collina as an official referee. This face to face picture of a rather heated discussion between Collina and me goes back to that championship. No doubts, during my long career he, probably more than anybody else, personified the referee figure, turning into kind of a symbol in the whole world as a great champion. Probably for this reason, it wasn’t just by chance that “Times” magazine gave him the 50th position on the list of the 50 “meanest” players of all times. Actually, looking at this picture, Collina does look mean. And maybe so do I. It happens on the pitch. The relationship between a player and a referee during the 90 minutes of a game can’t be any different, a bit tense, as we clearly represent the opposite parts. It is true that one plays against the opponent and not against the referee – it is important to remember this and above all to learn it well when one starts playing at the early age – but especially at certain levels some conflictual situations can occur. The most important thing is not to overdo it and to leave it all behind, together with tension and competitiveness, once the match is over. That’s exactly how it was between Collina and me. With him, like with the other referees, I argued quite often and resolutely, even more so after I put the captain’s band on and was given more responsibilities in the dialogue with those who arbitrate the game. But we have always respected each other. Surely, in my memories Collina will be always tied to a particular, not exactly glamorous day…that damned 14th of May 2000 when we lost a scudetto on the last day, under the pouring rain in Perugia. And he was the referee of that match. Well, it’s in the past, even if we are still smarting over that defeat. After that match we met quite often on the pitch and – inspite of the picture that is rather angry…- our relationship has always been correct and balanced. To tell you the truth I have never had big troubles with referees. Sometimes I do protest and sometimes even rather fiercely. But it’s all part of the game. Anyhow I think I have never crossed the line. I have been red carded twice and I felt real sorry about it. I’m proud of all the compliments that a lot of referees paid me at the end of some matches (in Europa League after the match against the City, Eduardo Iturralde Gonzales even made me a nice present – his red card, autographed!) I think they have appreciated my behavior, during all the years of my long career. It has often happened that at the end of the match I was asked to give my jersey. The trustworthiness and reputation one has earned over the years mean a lot in the relation with referees and help to have a sincere and nice interchange. I know for sure that, being a football player, I will get angry again with them and probably they’ll get angry with me. But there’s no questions about referee being a fundamental and irreplaceable part of the game and they are worth every single bit of the respect for, sometimes far from easy, task they carry out… Even when it might end in an angry face to face situation! "JULY 1996 - SHE MORENO AND I"
Valle D’Aosta. We were in training camp in Chatillon.We started training for the new season, but we couldn’t stay away from that trophy, conqured just some months earlier, on the 22nd of May, 1996, during unforgettable night at Olympic stadium in Rome. We wore the uniform, black and white shirt like for the official photographs, without the scudetto symbol, that we had left for Milan, but with much awaited and wished triumph in Europe, that was still shining in our eyes. The Cup sparkled in the summer sun (it was rather strong also in Chatillon) and the black and white scarf wrapped around it made it even more beautiful… Moreno and I hold it by the “ears”. We were worth it. Juventus was worth it. I’m really fond of this picture because Moreno is a friend and is one of the players that has all the values of that fantastic European Champions team. To understand the reason it would be just enough to watch once again the final against the Ajax. It seemed he had an engine, unreachable in that part, up and down. A real driving force. But just the pitch isn’t enough to describe Moreno’s value, because those who met him in the changing room know the importance of people like him for the whole team. For me Torricelli is an example to follow, the demonstration of how much the hard work always pays off, how it is important never to give up following your dream. He came from Interregional to the top of the world with the Juventus, long way to go but he was never afraid to work hard and run twice more than the others. His secret has always been training and above all the belief that you can never stop improving. People with these characterisitics are catching, obviously in the positive sense, for all the team mates and the importance of these people inside the group is inestimable. That’s why I think that it’s very significant that next to me, with “our” cup is exactly Moreno who represents that team’s spirit and the will to win. And then, to think better, this picture has a historical value: did you notice the “tongue”? Evidently, I had already known that sooner or later i’ll stick it out on the big occasions… ten years later! Nice to see us that thoughtless, on that day in Chatillon. I want to wish Moreno to keep that smile and that lightness and let it help him to overcome very hard moments he had to live through recently. "AUTUNNO 2000 – A DIFFERENT KIND OF PIZZA…"
Night. Milan -Turin highway. Deserted highway stop. Zizou, Sonia and I were coming back to Turin from Milan after the event organised by Adidas. We ran away, no buffet, no dinner, we just wanted to go back home as soon as possible. But when one is hungry, one is hungry! We decided to stop. Apart from the bartender and the cash desk girl, there was nobody inside. Quick look at the counter, usual stuff… cutlet sandwich, Camogli, Fattoria… Finally I made up my mind, a slice of pizza Margherita, one of those that remain there until late, with the edge that looks like chewing gum. But I repeat, hunger is hunger: look at Zizou! I was quicker, the paper plate already shriveled on the table, next to the car keys, while the lady at the counter was preparing coffee, paying no attention to us. My team mate was still very much concentrated on his pizza, while I had already different topic to be concentrated on… Click. 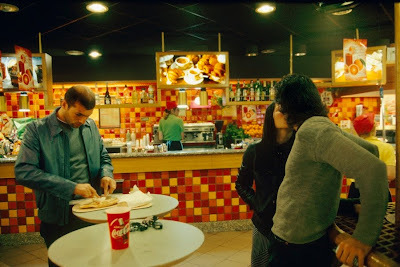 Gianni Giansanti, who always carried his camera with him, caught the moment without us even noticing it. It was already for a while that he followed me everywhere, he became one of the family. He took pictures that later would have been gathered in the book “Simply Del Piero”, actually it’s a part of my life, caught on the film of this extraordinary photographer. He was absolutely discreet in the way he entered my life (and my family) and it tells you a lot about the value of this man, not only about him being a Master of his Art. I trusted him. And you can see it. Here we weren’t posing, we weren’t even expecting to be photographed. We came to know about this picture only after it was developed. Everything is authentic. This is one of the pictures I care most about. It has got everything in it: love, friendship, simplicity, normality, tenderness, the will to stay together, to feel lucky, full of life. I look again at this picture today, Gianni is not with us anymore. One year ago his life came to the end. But his pictures, his works keep on living. As keep on living lots of beautiful memories inside of me.. Like the one of the night in highway restaurant with Sonia, Zizou, Gianni, pizza and photocamera that was able to catch the real moment inside the picture through the eyes of the person who carried it.